﻿Our breeding dogs are tested to WALA All Star Breeder standards! In addition to health, temperament is a huge priority for us. Three of our moms and many of their offspring have been certified as therapy dogs! 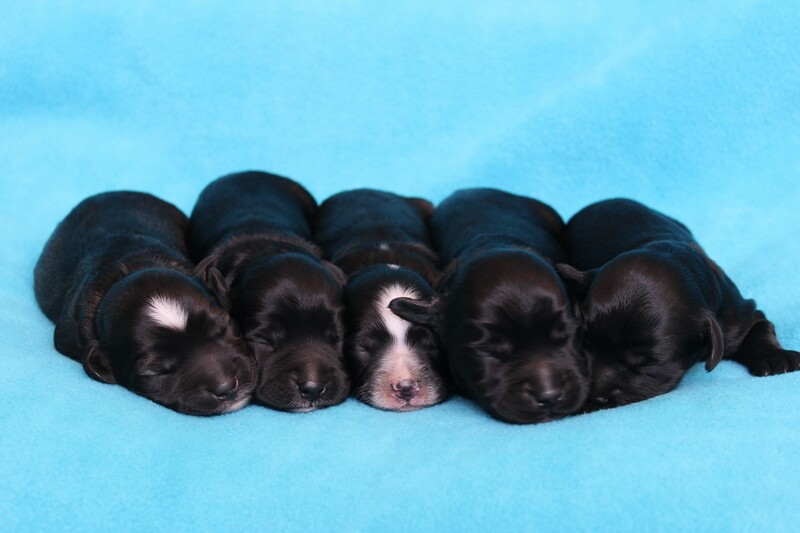 ​Please go to our labradoodles to learn more about the parents of our upcoming litters﻿. ​Is there any hope? YES! We only take a few reservations in advance. As a result, we virtually always re-open our wait lists after the puppies are born. About 30% of our puppies go to families who apply after the wait list has initially been closed. Although we are no longer accepting deposits, we will happily keep approved applications on file and notify you of any openings. You must submit an application to be considered for our back up list. ​Please Note: This page is up-to-date and reflects all our current breeding plans. When new litters are planned, they will be announced on this page. Please LIKE our Facebook page to hear our latest puppy news! This litter is FULLY RESERVED! We loved Sparrow and Monty's first litter so much that we are repeating this breeding! Sparrow is our delightful Polly x Marlo daughter. She is one of our smaller girls, and will produce large minis to small mediums with our adorable Monty. We are expecting black and chocolate puppies, with or without white markings. We may also get partis, phantoms or sables. These pups will be large minis to small mediums, in the 20-30 lb range. We estimate that this litter will be going home in May. The timing will be confirmed once Sparrow has been bred (giving families on the the wait list 4 months' notice). Please Note: we are ONLY accepting reservations from families who are open to ALL of the colours expected from this pairing. This is because we have no control over how many of each are born, and it's important to us that everyone on the wait list be delighted with their new family member. Thank you for your understanding! Sparrow and Monty's first litter consisted of 4 blacks and 1 sable (on left - born black), despite each puppy having a 50-50 chance of being chocolate! ​Sparrow is a wonderful mom who gives her puppies a fantastic start in life! Based on Sparrow and Monty's colour genetics, we expect a range of colours in this litter. However, their last litter was a perfect example of why we do NOT accept reservations based on colour. Firefly is our wonderful Keesha x Kodiak daughter. She is a gentle soul, and her health testing is off the charts! She is an AMAZING mama! Molesley is a sweet, stunning boy co-owned by our friends at Earth Angels Labradoodles and Prairie Doodles in Alberta. Molesley is part of the Dog Tales reading program at his neighbourhood school. 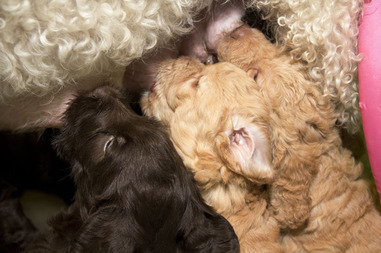 Puppies are expected to range in colour from apricot cream to red with or without white markings. We may also get an apricot or red and white parti or two. Puppies will be larger mediums in the 30-45 lb range. We estimate that this litter will be going home in June. The timing will be confirmed once Firefly has been bred (giving families on the the wait list 4 months' notice). We can hardly wait to meet Fred's little brothers and sisters later this spring! Acorn and Monty make adorable puppies!!! They had a litter together in 2018. The puppies will mature to be small mediums in the 22 - 32 lb range. They will be genetically chocolate or black, but their appearance will vary widely due to all of the fancy recessive genes that both parents carry (parti, phantom, sable). We expect these puppies to have sweet temperaments. Both Acorn's dam and Monty's dam are certified therapy dogs. Apple is our Jasmine x Paddington daughter. She is impossibly sweet and silly, and adorably eye-catching in her beautiful lavender-coloured coat. Apple started her breeding career off with a bang this past summer. She had a litter of 10 wonderful puppies with Kodiak. I am going to try something a little different for Apple's 2019 litter. Details coming soon! Puppies will be medium-sized. ​We estimate that this litter will be going home in the later fall. The timing will be confirmed once Apple has been bred (giving families on the the wait list 4 months' notice). Bowie at 11 weeks. Bowie is the delightful breeding prospect I retained from Apple and Kodiak's 2018 litter. Please LIKE our Facebook page to hear our latest puppy news! ﻿Leapfrog is a small breeding program known for its exceptional bloodlines, extremely high standards in health testing, and outstanding customer support. ​Our reservation lists typically fill up several months before puppies are ready for their new homes. To avoid disappointment, please contact us well in advance.﻿ We look forward to hearing from you!